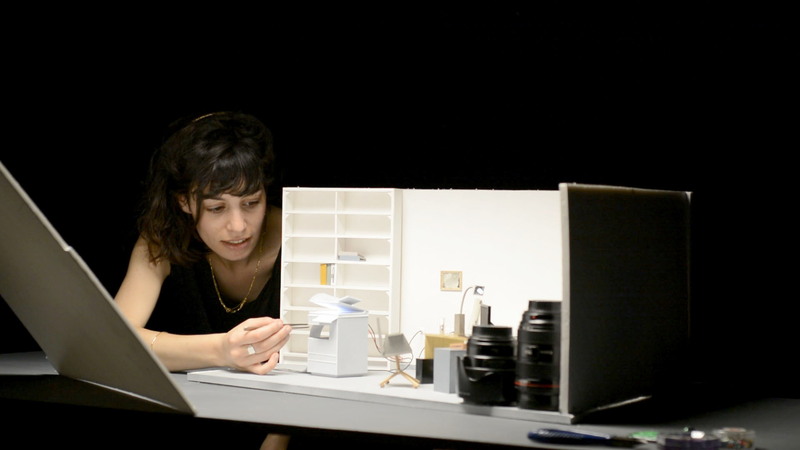 Exploring how recounted memories provide a window into the lives of those close us, Artist and Animator Renana Aldor – who last year gave us a stop motion instruction into the lost-wax technique of bronze casting – embarks on a miniaturised exploration of her relationship to her grandmother’s past in abstract short La Femme Qui Cherche. We asked Renana to share the techniques used and insights gained on her mysterious journey into familial connection. The genesis of my film La Femme Qui Cherhce (The Searching Woman) is rooted in my inability to see my grandmother’s past. The film evolves as an abstract journey in search of a hidden matriarchal figure, inspired by my late grandmother Esther and her memories of Oran her hometown in Algeria. 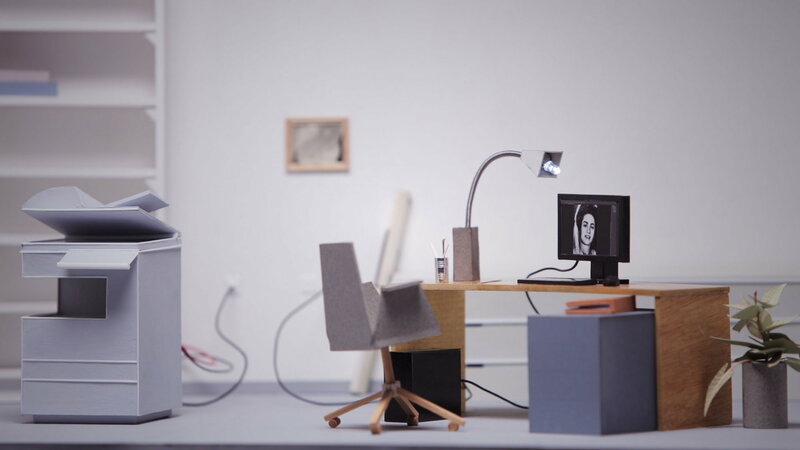 The viewer experiences the journey by passing along four miniature domestic spaces: the office, the bathroom, the kitchen and the living room. The first space that appears in the film is the office identified with my studio and my creative process. It marks the beginning of my search. The picture of my grandmother, the missing woman, appears on the computer screen and then is printed on ‘Infinite’ paper until finally the printer creaks and stops, while the picture continues to fade away. The second space, the bathroom with a bathtub covered with a curtain of palm trees prints on it. Here, the camera gets closer and closer, attempting to peek on the woman bathing in the bathtub. 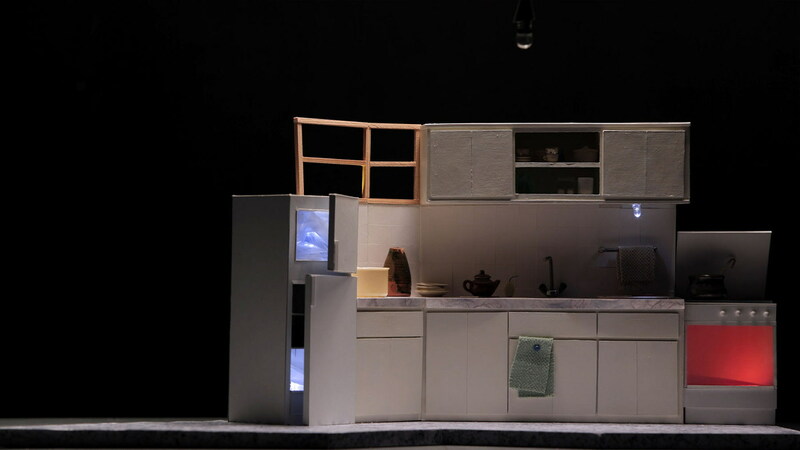 The kitchen, next space, is floating in the darkness as a monument of my grandmother’s creativity. And finally the living room is furnished as in the 50s. 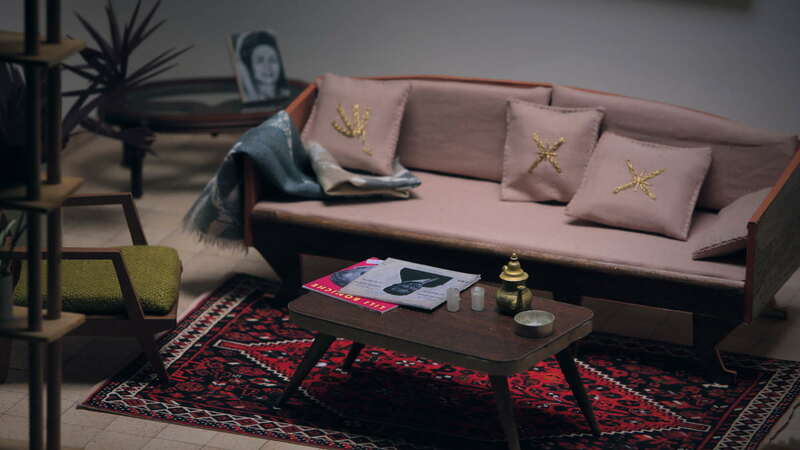 Building the miniature models of the furniture and objects of my grandmother’s home was an exercise in sensual memory. Some of the furniture I actually remembered, some resembled my own, and some were a figment of my imagination. It was important for me to create a three-dimensional sculptural space – a structural system with depth and hidden areas. Shaded uncanny corners that can function also as the space of the unconscious. There is a powerful connection between memory and imagination, nostalgia and fantasy. One of the visual elements I integrated in my film is a grid pattern. The grid appears several times, in different forms, and is always loaded with a symbolic intent, for instance: when the grid appears as coordinates on a map, used for locating places, it is the visual form of the digital material – the pixels, and it exists on my cutting board on my working table and therefore emphasizes my own presence in this creative process. Another key element in my film, is the sense of sight or the lack of sight. After my grandfather passed away my grandmother started to gradually lose her sight, until finally she saw only shadows and light fragments. Her physical blindness is symbolic to my own metaphorical blindness when referring to her past. In that sense, the film embodies my possibility to see through her eyes and to bring back her eyesight. The ‘living room’, is where my grandmother spent most of her days while her health deteriorated, the same room where I heard all of her stories and childhood memories. At the end of my film we are in her living room, where the revelation emerges. The hidden woman glimpses through the shadows, her eyes wander on the wall, finally, looking directly to the spectators. Ironically, the search ends and the viewer knows nothing new about Oran or the hidden woman, just as I know too little. Yet, the film has offered the most sensual solution for tracing my memories. I worked on the film for a year. At the beginning of the process I had some strong visual visions I wanted to express. I started to gather fragments of ideas of objects and furniture that I was intrigued by and drew sketches of these hypothetical collections. Then I organized these objects and furniture into different domestic spaces and created four Photoshop collages of these rooms. At this stage, I started to think about the missing woman and about the structure of the storyline referring to my grandmother’s biography. It took me around three months to build the miniature sets and props. I used different materials such as paper fabric and thread. I worked in a studio at the Bezalel Academy, which became my second home. I shot my film in the same studio which was equipped and suitable for a stop-motion production. I used Dragon-Frame to animate the objects and the camera movements. I collaborated with the Photographer Tomer Zmora who used Canon 5D mark III with different analogue lenses that gave the sets their special quality. At that time, I also worked with Ori Kadishy on the sound design, and developed a sensuous sound in order to revive the presence of the hidden woman. While I shot the film I worked with a storyboard, however, because I created a non-narrative story – an abstract journey – I let myself stay open for creative possibilities to arise. Then, during the editing process I shaped the film to its final form. My grandmother used to tell me many stories about her childhood in Oran. Small heroic stories in a tough survival reality – how she used to work every day in her father’s shop and take care of her younger sister and brother after her mother passed away. She also told me about the movies she loved to watch in the cinema, and how beautiful the French women were dressed. Such images and stories became engraved in my imagination. I think that there is a powerful connection between memory and imagination, nostalgia and fantasy. Memories are elusive by their nature. Consciously or unconsciously they can be mixed with fantasy or wishful thinking. I believe that my grandmother selected her memories, and especially the memories she decided to share with me. In that sense, she created an idealization of her past. A sense of nostalgia I was looking for. A contradiction between fantasy and reality that captured me and filled me with inspiration. Through my film her memory stays alive. My grandmother passed away in her home while I shot my film. Suddenly, the search for the missing woman through the miniature sets, was loaded with my longing to my grandmother’s presence in real life. The film is also my farewell and goodbye from her, from her home, and from the life she had. Through my film her memory stays alive. Currently I’m working on a new installation project for an upcoming exhibition in September 2017, as part of a residency program I’m a member of – The Underground Academy at the Mamuta Art and Media Center in Jerusalem. I’m also developing a new script and research for a new experimental film which has a similar personal approach.